The energy sector has been beaten down hard over the past 8 months. Since November it looks like it has been bouncing along the bottom with investors buying on the dips when dividends are high and prices are dirt cheap for many solid companies. I must point out that the broad market and energy stocks look over bought and ready for a sharp pullback any day now. But if oil breaks out above $55 and starts rallying higher energy stocks will follow suit. 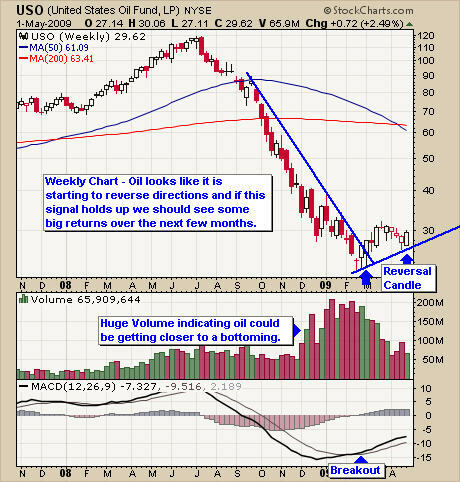 Keeping our eye on crude oil prices is key here. This Oil Fund has created an intermediate buy signal as of Friday’s close. It appears the price action for this fund is signaling a reversal. The long lower candle wick which was formed two weeks ago touched our support trend line and rallied strong into the close. Then last weeks move higher completed the reversal candle. Risk for entering this trade is about 11% if you set your stop below the support trend line. I only focus on the daily charts and enter trades with 3% or less risk. 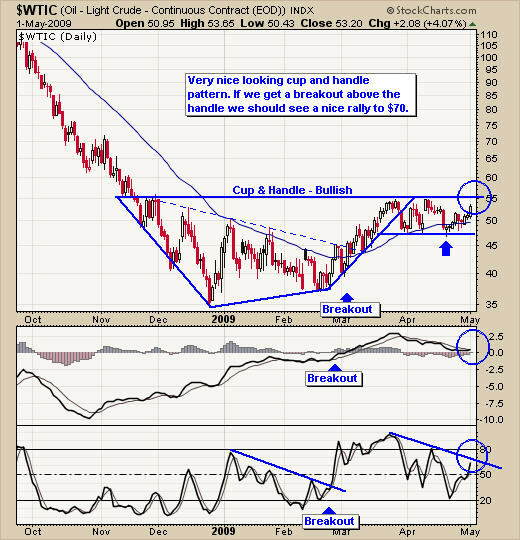 Oil and energy stocks look to be forming a bottom which is a great sign for oil and other energy products like natural gas. 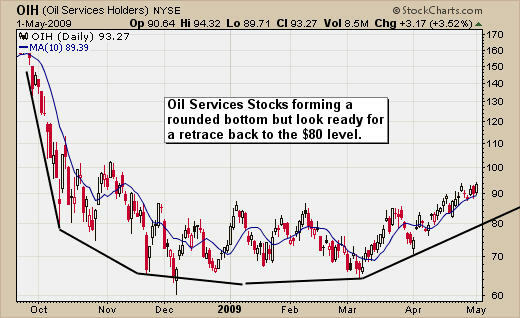 Oil service stocks have been climbing for several weeks and look ready for some type of pullback. It could be a sideways move or a quick 2-3 day drop. Crude oil prices continue to hold a solid cup & handle pattern as we wait to see which way prices will breakout. Waiting for a low risk setup in our trading funds is difficult but it must be done to keep our risk: reward ratio in line. I posted a weekly chart of the USO Texas Oil fund because many you trade this. This weekly chart looks very bullish because over the past two weeks we have had a reversal pattern form. This type of setup is for longer term traders who carry more risk and provide more time for trades to mature.